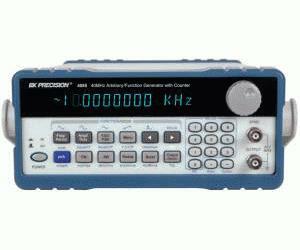 Model 4085 is a versatile, laboratory grade synthesized function generator. Direct digital synthesis (DDS) techniques are used to create stable, accurate output signals for all 27 built-in standard and complex (arbitrary) waveforms. The generator produces high purity, low distortion sine waves and provides a full suite of analog modulation capabilities including AM, FM, FSK, PSK, pulse modulation, burst mode and linear/logarithmic sweep combined with multiple trigger modes. The 4085’s versatility and capabilities make it an ideal tool for many general-purpose test and bench applications or for use in Training and Education.